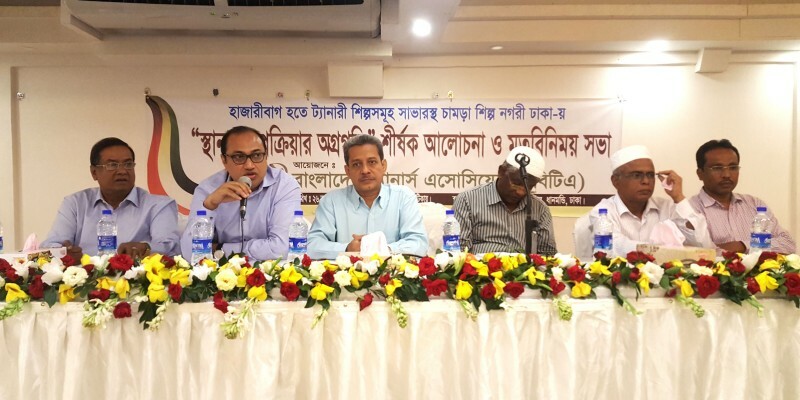 Bangladesh Tanners Association (BTA) > Latest News > Open Discussion Meeting About Relocation ( 26 October 2016 ). Open Discussion Meeting About Relocation ( 26 October 2016 ). An open discussion meeting was held on 26 October 2016 on “Update of Relocation of Tanneries In Its New Premises at Savar” organized by BTA. Chaired by Md. Shaheen Ahmed, Chairman of BTA, the Seminar was attended by Mr. Mustak Hasan Muh. Iftekher , Chairman, BSCIC as Chief Guest . The meeting was also attended by Mr. Md. Abdul Kayum, Project Director, Savar Tannery Estate Project; Mr. Md. Shakawat Ullah, Secretary General, BTA and Mr. Md. Mizanur Rahman, Treasurer, BTA. The meeting was also attended by Mr. Md. Shamsul Huda (Hudu), Ex. Chairman,BTA; Mr. Md. Harun Chowdhury , Ex. Chairman, BTA and Mr. Md. Mosharaf Hussain, Ex-Secretary General, BTA. The owners of the Tannery Factory discussed several issues and claimed the compensation from the govt. as allocated for them at an earliest convenient. The chief guest had a patience hearing and he said that he will try to solve the problems as quick as possible. The meeting ended with the vote of thanks from Chairman. To see more photos of this event please visit our “Photo Gallery” page.